At the beginning of the Fed’s march to higher rates, depositors had become numb to near-zero rates on deposits. Memories of 5% 1yr CDs from 2007 faded along with the 1st iPhone. Since December 2015, Fed’s initial target rate increase, the frequency of rate changes has gone from an annual adjustment to almost quarterly. Over the same period, delaying the need for additional funding, many community banks used investment portfolio cash flow to fund loans. With loan demand continuing, shrinking the investment portfolio is less of an option today as on-balance sheet liquidity approaches minimal acceptable regulatory levels. Now community banks are turning to deposit gathering as a way to manage wholesale funding levels and fund loans. And so it begins………. Each week, the FDIC publishes their Weekly National Rates & Rate Caps report that is intended for compliance with FDIC rule FIL-25-2009 to restrict a not well-capitalized bank’s ability to gather deposits. The intent is to reduce FDIC’s exposure to depositors of a troubled bank that could become insolvent. Where the challenge comes is in the calculation. The Weekly National Rate is determined by the simple average of rates offered by ALL depository institutions and their branches – easy enough, right? Well, there are 90,000 total banking branches in the US and 5,500 banks with at least one branch. You may or may not know that 55 bank charters, located in densely populated areas, account for over 50% of total US branches skewing the established Weekly National Rates. These large institutions have invested billions in platforms to attract and service transaction accounts, providing them the ability to hold interest bearing accounts like Money Markets and CDs rates low. 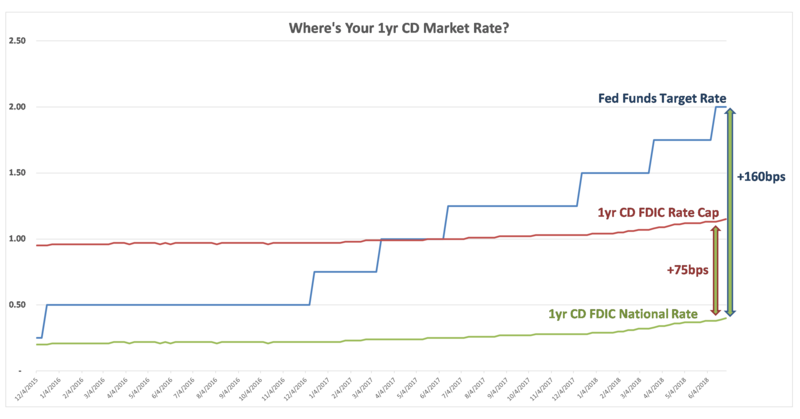 Another challenge is that FDIC’s Weekly National Rates are based on offered “board” rates and institutions often use “special” CD rates to compete in their respective markets, which are often significantly higher than “board” rates. Does Market Rate Equal High Rate? Short term interest rates are up 175bps since the fed started raising rates and depositors have taken notice. While the spread between the Fed Funds Target Rate minus the 1yr FDIC Weekly National Rate has widened from 5bps to 160bps (chart below), most community banks are experiencing more aggressive pricing changes in their local markets. By current regulatory definition, deposits offered with a rate that is 75bps over the FDIC Weekly National Rate can be classified as “high rate”. For example, the current 1yr FDIC Weekly National Rate is .40%, placing the Rate Cap 1.15% and most community banks would be unsuccessful in raising or retaining CDs at the Rate Cap level. This becomes problematic in the event a bank is subject to a prompt corrective action (PCA). So while community banks are starting to increase local deposit rates consistent with their historical repricing correlations, the classification of these deposits are being removed from “core” and placed into “high rate” by regulatory examiners. This creates a unique situation for liquidity modeling and can create an unnecessary liquidity trap for community banks even if they are organically-funded, and institutions with a higher reliance on wholesale funding could find themselves in an even more stressed liquidity position because of potential reductions in funding capacity and roll-over risk. This is alarming, especially in the event the banking system experiences a credit correction in the next several years. Now onto some positive developments for deposits. Immediately following the financial crisis, new regulation classified reciprocal deposits as “brokered” because of a fee paid to administer the program. A reciprocal deposit program enables institutions to keep large ($250,000+) deposit relationships on their balance sheet while providing full FDIC coverage, which in many cases are local public funds. However, even though the bank had a core relationship with the customer, these funds were classified as brokered. The brokered classification made these deposits subject to PCA restrictions that could create liquidity stress as the bank would have to locate collateral alternatives and secure these large depositors. Fast forward to 2018 as Congress passes the Economic Growth, Regulatory Relief, and Consumer Protection Act. This new law provides relief from certain rules and regulations for community banks. The provision that stands out for deposits is that reciprocal deposits are no longer considered “brokered deposits”. Community banks now have the ability to better serve their local municipalities by accepting larger deposits, that require collateralization, and improving the bank’s overall liquidity. There is a 20% of liabilities to $5 billion limit for well-capitalized banks who receive an “outstanding” or “good” on their most recent examination. If the bank were to drop below well-capitalized, they could continue accepting reciprocal deposits at its current level without a FDIC waiver. As short-term rates continue their inevitable rise, depositors become more vocal in asking for higher rates and banks may find themselves in a precarious position when it comes to liquidity modeling. A biproduct of the last recession were numerous rules limiting community bank’s ability to manage depositor’s needs and potentially imposing undue stress on their liquidity. And while some of these rules have been softened, banks should model scenarios that take into account local deposit outflows, not just a result of negative PR, but possibly as a result of the bank’s inability to match local market rates in the event it becomes subject to a Prompt Corrective Action. Also, management should establish minimum liquidity tolerances in the funds management policy and include additional scenarios in the Contingency Funding Plan such as a change in PCA status and roll-off of deposits that could be deemed “high rate”.